Oil on canvas, 35 x 45 cm. 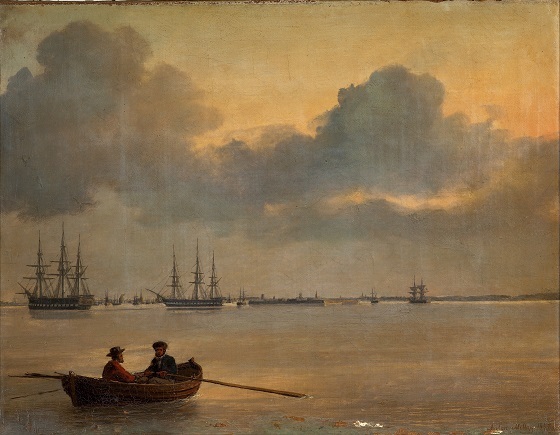 With this evocative marine painting of Copenhagen’s Rhed (an open anchorage area near the city), Anton Melbye walked in the footsteps of his master C. W. Eckersberg. However, while Eckersberg depicted the Danish artist Thorvaldsen’s festive arrival and reception at the Rhed in 1838, Melbye sought to capture a more timeless evening atmosphere in his work. It is clear from the painting that the artist was intrigued by the way the glow from a golden evening sun is sporadically reflected in the glassy surface of the water. The peaceful atmosphere is highlighted by the little rowboat in the foreground, gliding surely and safely through the calm waters. This evocative work distinguishes itself further from Melbye’s own historical paintings of the same location with its tranquil appearance.